As you’re poised to lay your dairy farm, you explore different sources of capital to fund your establishment. Of course, the amount of money one needs is quite significant, but the burden can be balanced or decreased enough if you seek loans or financial assistance from the government through banks. Farmers often feel bewildered because they neither have enough money on hand to start their own business nor are they aware of any government schemes that could help them with the same. The dairy farmers seeking monetary support to start their dairy farm must research on the different schemes laid down by the government in favor of the growth of the dairy industry, and expungement of challenges faced while setting up dairy farms. One such programme initiated by India’s Department of Animal Husbandry, Dairying, and Fisheries is “Venture Capital Scheme for Dairy and Poultry,” launched in 2005. 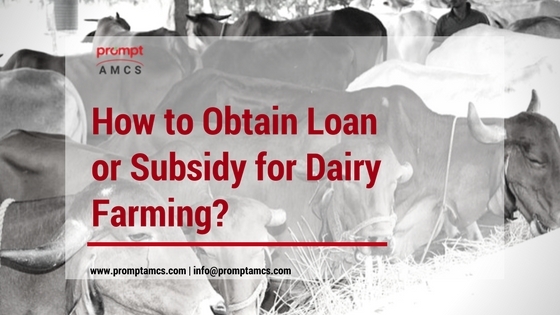 Let’s delve into the eligibility and procedure for obtaining a loan or subsidy from the government for dairy farming. Who are eligible to receive the NABARD subsidy for dairy farming? An individual can get the subsidy for all the components outlined in the scheme but just once for each. If more than one family member needs to avail the subsidy, the member(s) must set up separate farm infrastructure at distinct locations, at least 500 meters away. How to receive the NABARD subsidy for dairy farming? Choose the type of dairy farming activity you wish to establish. Register a business entity, a company, or an NGO. Prepare a detailed business plan or report on the dairy farming activity you want to set up, and a request towards bank loan for the same. Submit your loan request to any of the banks that are entitled to refinance from NABARD. The list of such banks working in cooperation with NABARD includes commercial banks, regional rural banks, state cooperative banks, state cooperative agriculture and rural development banks, or other institutions. When the loan request is approved, the requester will have to implement the dairy farming activity using his/her capital and the bank loan. The rate of interest, tenure, collateral, and authority to grant the credit remains with the bank. On the disbursal of the first installment of the loan, the bank applies to the NABARD for the approval and release of NABARD dairy farming subsidy. On the acceptable fulfillment of the loan by the requester, the amount in the Subsidy Reserve Fund Account is amended against the last set of loan repayments due in the near time. Dairy farming is a rewarding business provided you gain sufficient knowledge on the practices, implement right strategies and tools, consider prior precautionary measures, seek expert & veterinary advice, and invest enough money in establishing dairy farm suitable to your needs. The government understands the role of dairy farming in the national prosperity, and therefore, lends loans or subsidies to the dairy farmers to aid and benefit them in the same.